We begin creepily with three women in a bed and a man waking them saying it’s his wedding night. They all look at him adoringly. The Man they keep talking about is lurking in his truck watching when a security guard pulls up – and helpfully offers to fix his truck when he claims he’s creepily lurking because of a flat battery. Helpful security guard gets strangled with jumper cables. That’ll teach him for kindness in a Hellblazer world! Just in case we weren’t making the connections – cut to The Man (who has a really strong Cajun accent) preparing a branding iron presumably for the guard he just strangled. Back to John & co and Jimmy flirts with Zed (much to John’s jealousy) and Zed sees a ghostly green aura around him. They’re out digging up detective Dupree’s body discovering the brands were “devil’s brands” and that our killer/kidnapper is a Satanist. While they’re there another zombie appears – Gary! He looks very keeper-of-the-crypt (not a compliment, Constantine) warning John there’s a price on his head. The newest kidnapped girl, Vesta, walks around the house – with arcane symbols and a whole lot of flies – growing steadily more panicked because she doesn’t remember how she got there. When the other three girls show up she clams down – almost supernaturally (which is kind of a relief because it means woo-woo was involved and Vesta didn’t lose every last modicum of sense). Vesta still has doubles about leaving her mother – and the smell (which disturbs the other girls) but they continue to calm and quiet her. John, Jim and Zed visit Vesta’s mother’s home trying to get a vision but Zed is too distracted (firstly by a price on John’s life which John is quite blasé about and secondly by seeing a vision of Jim dead). She doesn’t know whether to tell Jim or not – and Manny drops in to be reassuring and comforting (him and Zed are great together) and marvel at her having a choice on whether to act or not (but not, actually, give any useful advice or guidance). John uses a rather risky spell and tracks where Vesta went. They head that way and Jim again tries flirting with Zed and trying to see what’s wrong with her. She continues to see him all ghostly and dead so avoids talking to him because it’s kind of creepy. John ends up fighting Papa Midnite’s zombie in the funhouse (of course), at least Papa Midnite makes it clear it’s business, not personal. After beating John up a bit, the zombie is stopped by Jimmy shooting it in the head – which seems to hurt Papa Midnite as well. An interesting zombie depiction but I give it 1 star for effectiveness. Zombies having demand they speed up the investigation, Zed has a vision and gets them an address (and sees the fire throwing Satanist and a mangled security guard). They set off – and Jim decides now is the time to ask if Zed’s visions are infallible (all the whole not knowing she’s seen his death). They arrive at the address, spied on by Papa Midnite’s magical raven, and let themselves in hearing someone banging around inside. They find the security guard’s body – crucified and a bit mangled. Seeing Papa Midnite’s really unsubtle spy, John sends Zed and Jimmy ahead. And the security guard’s body collapses, no longer looking like John. The real John attacks Papa Midnite from behind. He knocks Papa Midnite out and steals his stuff – but leaves him alive. He then calls Zed and Jimmy (using Papa Midnite’s phone) and their investigation and traffic cameras caught a man who previously murdered his wife because “satan” told him she wasn’t the “virgin bridge he deserves”. Elsewhere, Vesta is dressed up in a wedding gown and meets The Man. He leads her to a satanic altar to begin the wedding ceremony and Vesta becomes afraid and tearful. When he tries to strangle her, she knocks the lantern out of his hand and runs. She flees the house, screaming. John arrives at the house and finds the bodies of the three previous “brides.” He’s joined by Zed and Jimmy and they search the grounds – while Vesta is captured by The Man. They find them, John saving the girl while Zed beats The Man repeatedly with a shovel until Jim stops her and arrests him. John asks Jim whether arrest is the best way for a man who killed 3 girls. Jim tries to protest that he isn’t a demon or ghost – but John questions the idea of him being a man. Jim releases The Man and tells him to run – and we hear a gunshot. Vesta is returned to her mother. John casts a spell to release the ghosts of the three dead girls. Papa Midnite appears to be arrested by the police. Zed tells Jim what she saw. Jim says he’s going to make the rest of his life count and kisses Zed. John looks on and he and Zed share a pensive look. Seriously Constantine do you think ending on such a dramatic cliffhanger will stop you being cancelled? Actually this episode touched on a lot of things that beg for more development – and not just Manny’s loyalties. The idea that evil people – like child killers – may now have access to magic because of the Rising Darkness is a big element to develop. Jim Corrigan is another. Zed’s story remains unfinished – this whole last episode is begging for a second season. But it also highlighted some of the flaws – like the racially diverse victims of The Man; it’s a perfect example of Constantine having a racially diverse cast but not really using them and instead repeatedly focusing on the White guy. On the podcast I’ve said repeatedly that Constantine frustrates me and now we have the season finale I have to repeat it. This season frustrated me. I think the series also relied a lot on comic shout backs without development or exploration. Jimmy, Papa Midnight – these are characters from the Hellblazers comics and I think I’m supposed to squee and yell “oh my god it’s him” except very little is done with them on the show. Unless you’re going to get super excited about the mere fact that a show based on the comics contains characters from the comics, there’s not a lot there. Maybe if you’re a huge fan of the comics things like this epiosdes’ call out of Jim Corrigan becoming the Spectre may be exciting, but otherwise, not so much. The show treats them as major characters I should be excited by but relies too much on the comic fandom for that excitement. This same lack of potential carried through to the depiction of marginalised characters. We had a great potentially strong female character in Zed – but her powers made her vulnerable or a tool as much as they empowered her, we never explored her backstory except, again, in the context of her being vulnerable and for several episodes she was simply benched entirely, often for convoluted reasons. The same applies to Manny – Manny and Zed would have made the main cast of four contain two POC – but again we had him disappear for several episodes, constantly be put in a position where he could do nothing when he did appear and most of those appearances are very brief, time for a couple of lines of snarky dialogue then he disappears. Annie is another potential strong female character – and she does seem to be competent and capable and even as ruthless as John but, ultimately, still calls to him for help and, equally, is less able to deal with their torturous past than he is. She is a cut-price female version of John and is, inherently, lacking in the role. Similarly, Papa Midnite tries to add some POC inclusion but comes with a whole bucket of tropes (being called “Papa Midnite” for one – and yes it is from the comics). He’s in opposition to John, which isn’t bad, but he is usually defeated by him and, often, not with much difficulty. He even calls on John to help even though they try to make the point about John being a generalist and Papa Midnite being a dedicated, powerful practitioner. Like Annie, what strength he has is measured against John and he is expressly cast as lacking – considerably so. This also leads to another recurring issue Constantine has – the magic and traditions of POC are cast very much as evil. The Brujeria is a South American magical group (and evil). Papa Midnite’s magic is repeatedly shown as dark and evil which is a trope that clings to depictions of voodoo. And do we even have to touch the “nothing darker than gypsie magic” line? That’s not even subtle in its antiziganism. There are no LGBT characters in the entire season. This would be annoying and wrong on any show – but is doubly offensive because John Constantine in the comics is bisexual. He has been straightened (something which isn’t shocking since Goyer is behind this show and he did the same straight wash on Da Vinci’s Demons). The only thing more disgusting than seeing John turned straight is seeing a fandom being more upset and concerned by him not smoking sufficiently than him being turned into a straight protagonist. This show should have been one of the very very few shows we have covered that has an openly non-ensemble LGBT protagonist. Instead it joins the list with the vast number of shows that erased LGBT existence. 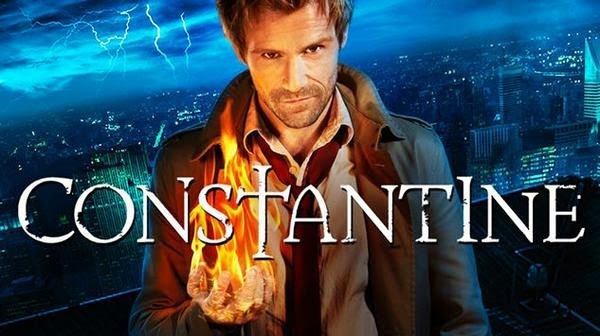 This is probably the last episode of Constantine unless the rumours are true and Syfy does pick it up. I’m sad to say that, for a show I was so looking forward to, I won’t miss it.